When Joe and Megan contacted me, they were frustrated. “Looking to redesign our home office/sitting room. It's a total mish mash of old furniture, toys, random book shelves and clutter!" she wrote. Two young professionals with two small kids who occasionally work from home, they were “desperate” to de-clutter and have more storage space. This is the first room you see when you walk into their beautiful home and it didn’t reflect the organized, put together vibe of the rest of the house. 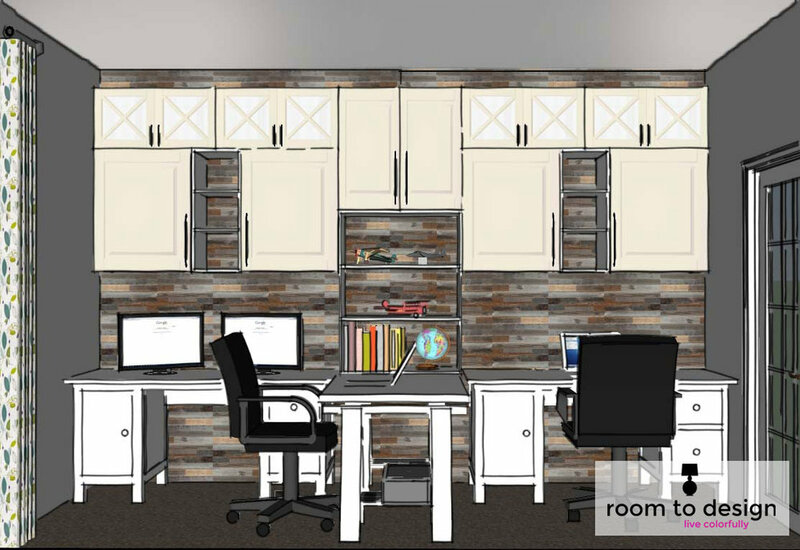 Megan wanted the room to be more functional, pretty and work better for her and Joe as a shared office space. But Can it be Done on a Budget? Megan sent me some inspiration photos and told me her ideas for the space. It had to have concealed storage and room for two work spaces. She wanted the room to look "finished" and cohesive. We could use an existing sofa, but the desks and storage furniture would have to be replaced. And we would be working with a $3,000 budget. Once I saw the space for myself, I quickly realized I could give her what she wanted, but in order to do that we would have to get realistic about what it would cost. 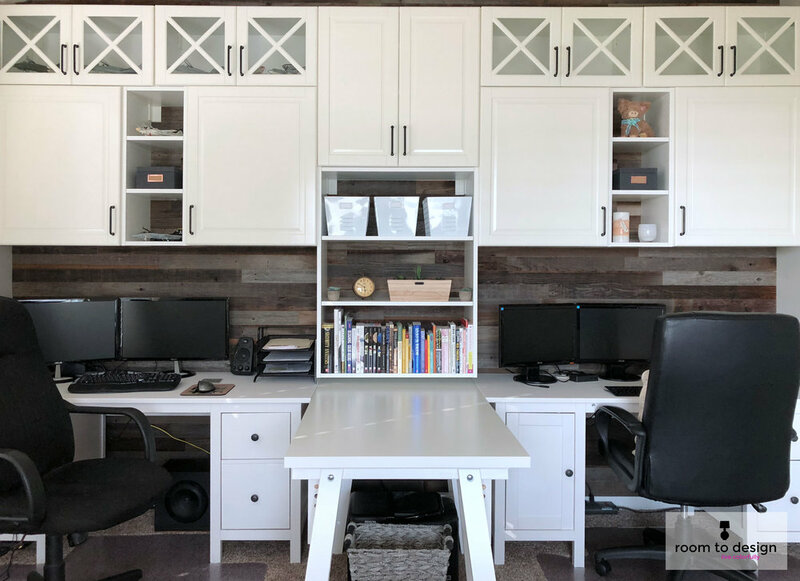 $3,000 might cover the cabinetry, and even then, it would not include any of the extras like window treatments, desks and other storage items the room needed to be the totally finished space she was dreaming of. Both Joe and Megan said they were willing to increase the budget to $5,000 to make the space something truly special and functional. I priced out custom cabinetry and it was instantly apparent that would eat up the bulk of the increased budget. I knew the most budget friendly approach would be for Joe and Megan to put in some sweat equity by using IKEA cabinetry and assembling and installing it themselves. After seeing the drawings for the space, they were all in! During our initial design meeting, we talked about giving the builder grade space some personality. We discussed wallpaper and paint as ways to introduce some color and texture. Megan had mentioned that she and Joe both liked a rustic weathered look. There are several ways to get this look. The most simple is a peel and stick reclaimed wood product that is easy to cut and install. I sent the shopping list and cabinet layout to Joe and Megan. They purchased all the parts from IKEA and started assembling and installing. There were a few bumps in the road. The IKEA shipment was missing some hardware and Joe had to put his engineering skills to work figuring out all the cuts to be made with the reclaimed wood. Working as a team, the couple persevered and ended up with a fabulous home office they could enjoy and take pride in! We added custom draperies, custom pillows and a custom cushion to the IKEA bench in front of the window. The cabinetry gives the concealed storage the couple longed for. The glass fronts on the upper cabinets lighten the look and can be used to display Joe's model airplanes. New IKEA shelving holds books and storage baskets. Megan sent me an email shortly after they had completed the room. "My least favorite room in the house has quickly become my MOST favorite room in the house." They both love the room so much, it makes working from home just that much easier! Do you have a room in your home that frustrates you? Drop me a line and I will turn your least favorite room in your house into your most favorite room in your home!